Some of the biggest fashion stories about the oncoming season come in the smallest of packages. From minimalist shine to maximalist expression, your fingers are pointing the way for some of the craziest trends of the year. What it is: Think of the mirror trend as Glitter 2.0, adding sophistication and a touch of futurism to those digits of yours. Otherwise known as chrome nails, this sleek and shiny trend is growing by the second, thanks to its accessibility and ability to complement anything you wear. Plus, you only have to look as far as the runway for 3.1 Phillip Lim to know this is one trend that isn't going anywhere, anytime soon. Who it's for: Perfect for minimalists or sleek professionals who want to amp up their look while keeping it polished. How it's done: Lucky you, there are quite a few different ways to achieve this look! From a few coats of chrome nail polish to metallic nail wraps, you don't have to be a beauty guru to add high shine to your nails. If you're more of a salon-type of gal though, you can also find a manicurist who can apply a highly pigmented fine mirror powder to each nail. What it is: Calling all gardeners, this one's for you! Ever wish you could brag about your green thumb without saying a word? Pile those succulents on your nails and let your hands do the talking. 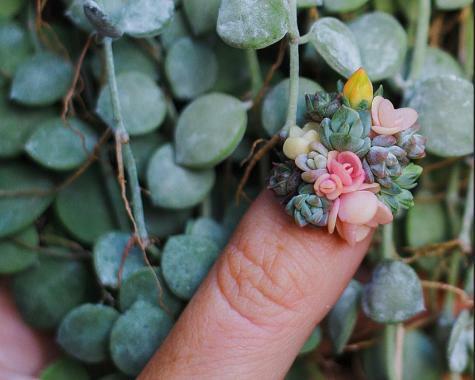 Thanks to artist Roz Borg, arranging tiny, living succulents on your nail beds is officially a real thing. And yep, that's right - they're still alive! Who it's for: This style definitely works best for people who do not have the need to use their hands. Like ever. How it's done: Start your garden by gluing tiny little succulents to an acrylic nail using Oasis Floral Adhesive. This will keep the plants alive while allowing them to fully secure to the acrylic nail. Once they're dry, apply the acrylic nail to your own and there you have it! The ultimate conversation starter. What it is: Started by Rihanna and made viral by Kylie Jenner, talon nails have taken the fashion world by storm, catching eyes and scratching corneas left and right. Also known as stiletto nails, some say this trend originated from the almond nail shape craze, thanks in part to singer Lana Del Rey. While this trend has been here for a bit, it's holding out in a big way, with more new twists - from clear tips to squared ends, as done by Marc Jacobs. Who it's for: Calling all drama seekers and dishwashing haters! You may need to relearn how to text or take a selfie, but once you master the use of your talon nails, you'll be unstoppable. Just ask Rihanna. How it's done: There are two main ways to get this look - either grow it, or stick it! If you're one of the blessed with naturally long, strong nails, you can file your way to pointy perfection within a single Black Mirror episode. However, if you're manicure-ly challenged, you might want a little assistance from a professional as getting those points just right can take a little practice. If your nails are more on the slacker side when it comes to growing, there's hope for your talon nails yet! Enter pre-shaped acrylic nails. Bring these babies with you to your next salon visit, and you'll be the female doppelganger for Wolverine in no time. What it is: Previously we saw the trend of piling hundreds upon hundreds of layers of nail polish in order to achieve a rounded, swollen bubble look. Think elephantitis of the nails if you need a visual. This year, there's a more sophisticated take that you might actually manage to wear in public without looking like you've contracted some sort of terrifying disease. Well, kind of. While your nails still might appear as though they've got a rare case of chicken pox, the overall effect is kind of pretty. Key factors include experimentation with texture and 3D, and a wide range of colors to play with. Who it's for: For those who love crazy nail art but aren't ready to sacrifice the ability to do everyday things. The less tedious way to get the look is to purchase 3D bubble stickers, which you can apply atop your manicure with the help of a little nail glue. 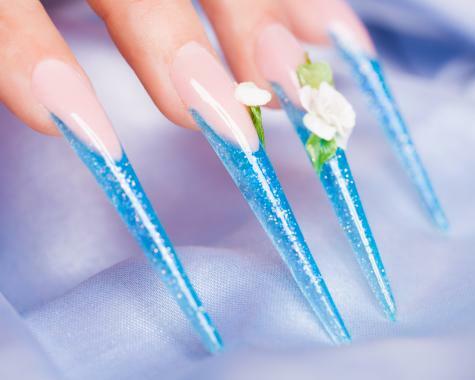 What it is: Over-the-top crazy, unfunctional nails aren't for everyone. But that doesn't mean ladies don't want a little fun on their fingertips as well, right? This sentiment was echoed by a slew of designers, such as Tracy Reese and Monse, who sent their models down the runway with short, neat nail shapes, all decked out in graphic designs. Who it's for: Tend to live in basics and resort to the same color palette every day? This one is for you. Step up your basics with a graphic touch and never feel boring in that LBD again. How it's done: While you can definitely go for this look yourself, if you want to fully achieve the clean lines that are necessary to make the graphic vibe really pop, it might be best to take this look straight to a professional. "When it comes to a specific look, it helps if a client brings some inspiration - a picture, some fabric, old album artwork, etc. Also letting us know ahead of time really helps so we can set aside the proper amount of time and get our creative juices flowing." Says Shakira Wilkinson, nail artist. While investing in a crazy trend might feel risky when it comes to clothing, the best part about experimenting with your nails is that you only have to live with it for a week or two - tops. Plus, the financial set back isn't nearly as much as a new piece of clothing. 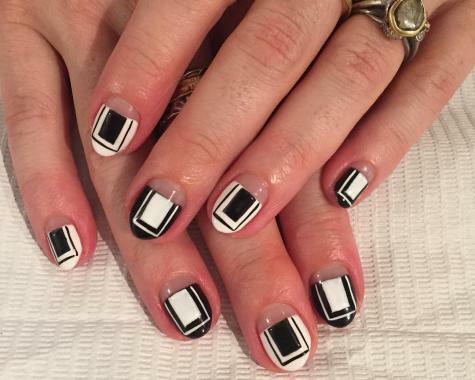 So why not finger a new trend and let your nails take a walk on the wild side?